AIFF's new mobile scouting application Scout-Me will further ease out the scouting process for FIFA under 17 World Cup. NEW DELHI: Encouraged by the success of the overseas online scouting portal which helped it discover players for the FIFA U-17 World Cup, the All India Football Federation today took it a step further becoming the first National Sports Federation to launch a mobile based scouting application to unearth future talent. AIFF's new mobile scouting application Scout-Me will further ease out the scouting process. It was through their overseas online scouting portal that AIFF had earlier unearthed Namit Deshpande and Sunny Dhaliwal for the Indian U17 squad which represented the country in their maiden appearance at the quadrennial event. The AIFF Scouting Application ScoutMe has been developed by a 17-year football enthusiast Kush Pandey who is pursuing his International Baccalaureate Diploma Program at Jayshree Periwal International School, Jaipur and incidentally has represented Delhi at the National Championships and also leads his school football team. 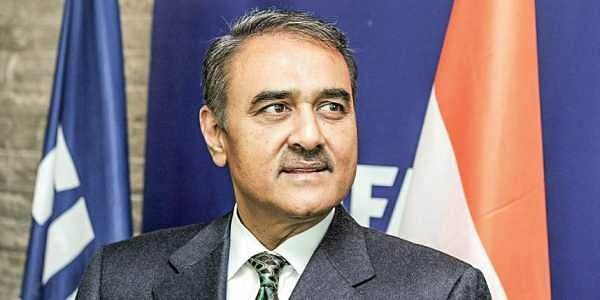 AIFF President Praful Patel who unveiled the scouting app said: "We have so much talent across every corner of the country but it's always not physically possible to travel the distance. Hence, we intend to bridge this distance through the ever growing and highly penetrative mobile application ecosystem." "I would like to also take this opportunity to congratulate Kush, the creator of this app. I would urge the youth today to invest their intellect in such constructive acts that only work as a showcase for their future and also help many like them in the longer run." AIFF general secretary Kushal Das said: "It's a great day for us as, with the launch of this mobile application AIFF becomes the first NSF to utilise the digital mobile world in a constructive manner to unearth future talents for the sport." Kush Pandey, the creator of the App said: "My interest in computer science along with my love for football and sustained help from my younger brother Arjun Pandey enabled me to create an application to scout prospective footballing talent.